Leigh Harrison decides whether to blame the player or the game. It’s nearly the end of Homefront: The Revolution. My plan of throwing rocks at the evil foreigners occupying the contiguous U.S. until they go home has, quite predictably, failed. Now the “Norks”—North Koreans, or boobies where I’m from—are going to gas the whole of Philadelphia. Being a well prepared revolutionary, I never leave home without a gas mask. But the subjugated Philly residents I single-handedly stirred up into my failed revolution aren’t quite as prepared. They’re writhing around on the floor or trying in vain to outrun the airborne death cloud, noisily choking on themselves and making my failure more apparent than necessary. But there are others who are just stood there, frozen in time and space. They’re not gripped by existential terror at their impending doom, as you might assume. They’re just characters in a videogame that doesn’t work properly. After a few seconds of this unintended rigidity, The Revolution remembers it needs to animate these people and they suddenly let out a little gasp and crumple to the floor. These half-finished automatons litter the level, turning what should be a harrowing episode into yet another metaphor for The Revolution. 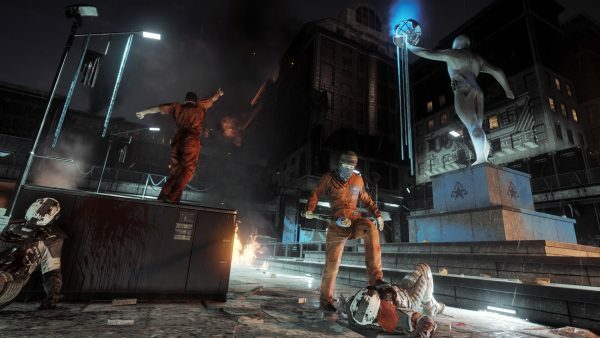 It’s a piece of flawed entertainment that dearly wants you to like it, despite being the videogame equivalent of unelected British Prime Minister Theresa May’s eight most treasured recordings. It’s uninspired, awkward, and just plain bad, is what I’m saying. There’s certainly a lot one could complain about coming out of, as I just have, a 25 hour scuba dive into the tumescent bowels of its mediocrity. As with the dying Philadelphians going off script and trying to replicate Pompeii, my time with The Revolution was punctuated with lapses in quality control. Occasionally mission scripting would break, preventing characters from delivering their lines and trapping me in a staring contest with a mute, dead-eyed guerrilla. Upon opening the doors to one of the many motorbike-harboring shipping containers, about 50% of the time the bike would promptly fall over. It was as if even a polygonal reproduction of an inanimate object wanted to distance itself from the game. 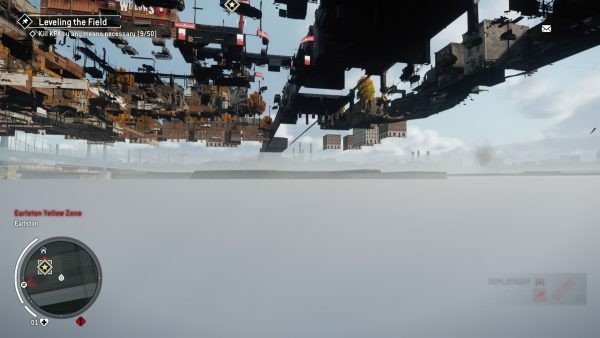 After clearing out a fortified stronghold the screen would fade to a cutscene, and when control was returned to me I’d be, for whatever reason, looking straight up in the air. The Revolution is a bad, bad game. It’s awfully reductive to say so, but nowadays published videogame discourse broadly falls into two camps. You’ve got the considered, well researched good stuff that’s featured weekly at Critical Distance; a website that only occasionally deems my own work worthy of wider attention, likely because it’s so radical, so risky, so dangerous, so goddamn crazy, that the so-called powers that be are too scared to show it. And then there’s the rest. This wasteland used to be comprised of overhyped previews, rehashed press releases, and 3,000 word reviews—you knew where you stood. Over the years outlets have transitioned into publishing more “Videogame Lifestyle” type content—stories about the wider landscape of games culture—as they diversify in the face of dwindling ad revenue to commodify more and more of their readers’ lives. Vapid articles about how Club Nintendo was great; or how the Switch might be wracked with design flaws but, hey, it still plays a new Zelda so gets a pass; or a good half of everything on the Overwatch fansite Kotaku. Stories churned out by joyless hacks just like me, who have to file copy to a strict schedule that precludes quality or integrity. While I don’t blame them for writing about games in a way that makes money, I do hold this business model responsible for further perpetuating, consciously or otherwise, the idea of “Videogames 4 Life”. Beyond the confines of this and the other superlative work at Haywire and websites of its ilk, there’s a whole world of people unable to approach games with any wit, irony, criticism, suspicion, or, dare I say it, disdain. “Games are great. Games are good. Games do everything they should,” sayeth the man on the street. There’s nothing I love unequivocally—beyond myself. I simply can’t fathom approaching anything, let alone big budget videogames, with not so much as a fistful of salt. But people do. Lots of people do. And while some fanbies were perhaps lost causes to begin with, the glut of VG lifestyle content hasn’t helped their search for much needed self awareness. In celebrating the worst aspects of modern pop culture—consumerism, fanaticism, anti-intellectualism—VG lifestyle pieces further dilute the already homeopathic concentrations of rationality and perspective within the wider videogame community. They give tacit approval to us taking things too far and too seriously. They tell us it’s okay to live our lives not just surrounded by games, but also the sordid paraphernalia of a cynical, all-encompassing geek culture that exists only to bleed us of cash in the name of belonging. “Club Nintendo had some really, really cool stuff on offer.” It didn’t. It allowed us to exchange credits accrued from hundreds of dollars of purchases for Nintendo branded trash, already wrapped and ready for landfill. After decades of media outlets reinforcing the notion that it’s all about “Videogames 4 Life”—that we can play the game, wear the t-shirt, and live the dream—many of us have been robbed of the capacity to string a critical sentence together. Playing games has become so much more than just playing games. It’s developed into a lifestyle choice all of its own, one that oftentimes defines everything about a person. At least you could use your Legend of Zelda 3DS XL pouch to bury a treasured family hamster in, if and when it expired—he did, on Monday, March 20th—but these reviews, these are as hopeless as a three pack of Nintendogs greeting cards (300 points). The Revolution is not, as I and many others have previously stated, a bad, bad game. It’s an average one, yes, but it isn’t bad. The inadequacies mentioned at the top of the hour are, largely, things to laugh at, not pour scorn on. The bikes repeatedly falling over are funnier than most intentional attempts at humor in games. The breakdowns in quest scripting are merely signifiers of how complex a videogame’s intertwined systems are. The frozen dying dudes are both of these things simultaneously. Problems like these signify a lot, but often not what we think they do. But let us also remember: all big budget games have quirks like these. Getting hung up on trivialities stops us celebrating what The Revolution actually gets right. Not since the sublime Vietcong, the overlooked 2003 Vietnam War-based claustrophobia fest, has a game made being underpowered and overwhelmed so engaging. With their laser guns and power armor, my North Korean enemies were always better equipped than I in head-to-head combat, and so spatial awareness and surprise attacks were a constant necessity. Sprinting across the war torn streets of Philly, ducking through bombed out buildings to avoid enemy patrols, and picking off stragglers when the opportunity arose, my time with The Revolution was primarily an exercise in hit-and-run confrontations. High ground was immensely useful, as was flanking, and the game’s detailed urban sprawls offered many ways to physically approach objectives. It was a thrill to dash up three flights of stairs, through a window, and over a rooftop to get the jump on a group of enemies. The Revolution was as much about carefully considering my environment and scouting out locations as it was shooting foreigners in the face. When all out combat did erupt, it was chaotic and a touch unwieldy; exactly what you’d expect from an untrained civilian wielding a jury-rigged assault rifle against a technologically superior foe. It’s easy to mistake a stylistic choice like this as a sign of ineptitude though, especially when the discourse prevents plurality of thought. If the game got animation, voice acting, script, motorbike physics, and mission implementation a bit wrong, then it goes without saying that the shooting mechanics, in not simply being pulled wholesale from Call of Duty, must also be a mistake, right? Nuance has been bred out of many a conversation about videogames, and now a game must be good in its entirety, with nary a slip up in sight, lest it be banished from our hearts and minds, never to be spoken of again. This of course works the other way, with diehard fans of a series happy to shout down the mere mention of problematic aspects of a game that don’t suit their personal narrative. Mediocrity isn’t allowed to exist. It’s just too confusing for us now we’ve been told it’s okay to form our entire understanding of our lives around playing videogames. “Buy a Switch, just wrap it in a towel.” “Get hype for this game and pre-order now to secure a sick alternative costume and three loot drops.” “Buy games!” “Keep visiting the site daily for videogame-based snack reviews so I can keep my job!” “Read about something that happened in Overwatch yesterday, and come back in an hour and do it all again.” “Define your entire personality around your love of games!” “Buy games!” “Please read all seven things I published today so I can keep my job.” “Buy games!” “Games!” “Kinja Deals. My job.” “Sponsored content. My job.” “Pithy lifestyle pieces. My job.” “Club Nintendo was awesome!” “GAAAAAMES?!!!?? !” The problem arises from the need for revenue, of course, not the people generating the content. But damn. 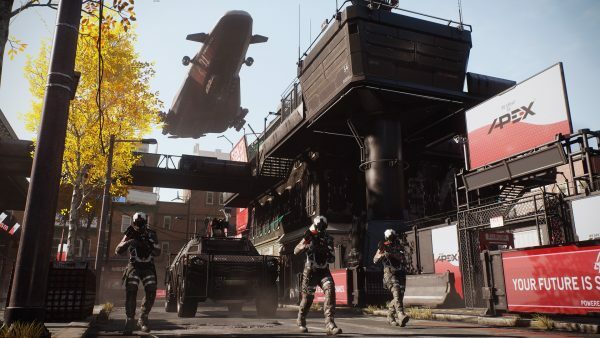 Homefront: The Revolution is a buggy, broken, chaotic mess of ideas. Parts of it are really, really bad. Parts of it are really quite good. I liked playing it sometimes. Others I wanted to pass out and for it all to be over. I’m holding both of these contradictory thoughts in my head at once and it hasn’t exploded. Not even a nosebleed! So I’m raising my flag and daubing my immediate vicinity in blue paint, just like the foolhardy Philadelphians in the game. I’m starting a revolution—of the mind. Free yourself from the shackles of your own flawed capacity for critical thought! Join me in engaging in nuanced discussion and not 100% loving or 100% hating things! They lose, by the way, the revolutionaries. But that doesn’t matter. Because it’s entirely possible to have a good time, to fight the good fight, even if you know you’re destined to fail. It’s part of the fun. Nothing is ever all good or all bad, and I’d rather go down in a blaze of genuine mediocrity than a fictional extreme I concocted to protect my fragile psyche. Viva la revolution! Leigh Harrison lives in London, and works in communications for a medical charity. He likes canals and rivers a great deal, and spends a lot of his time walking. He occasionally says things about videogames on the Internet, and other things on The Twitter.